After a lot of procrastination on fixing the cycle post rains, I got it fixed. New spokes, brake shoes, gear and brake liner cables, ball bearings, a tire-tube. The cycle rode like spanking new. I wondered what could be a stretch for the cycle to get going. I asked a few guys around for some inspiration, but couldn’t get the path or the company. So I resorted to the tried-and-tested Vandri Lake, or rather tested-and-tired. Almost two years back I had done the same route. However this time it was just me and the pedals. 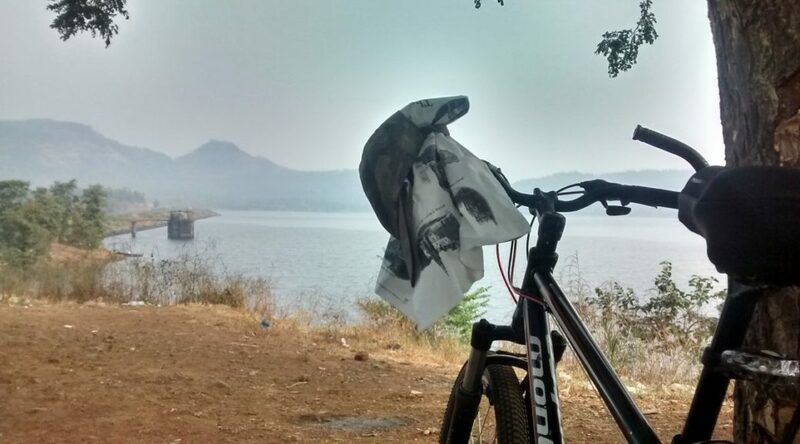 Left early morning by 6.30am, had tea and Parle-G near Vasai and reached the reservoir by 10.00am. 70km done in 3.5hrs. The weather was nice; cloudy so sun was dispersed and there was a hint of chill in the air which was great to push me hard (that’s what I call riding at 20 kmph). Rested back on the trunk of a tree with its roots hugging me around. 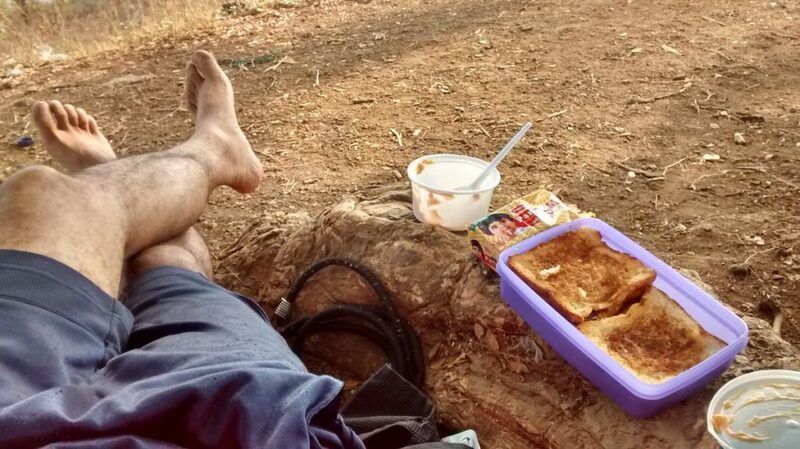 Had a breakfast of 6-7 toasts with mayo from my tiffin. Reminded me of picnics in the school, just that there were loads of friends to play around with and no towering task of pedaling back 70km. A dog and its cub came by and I shared the breakfast with it and its pup. Started by sharp at 11am. Thinking, earlier the better. But as it turned out, it wasn’t early enough. In just 1 hour, it was noon with all its glory sapping away the already dwindling energy. The roads seemed longer, more inclined and to add cherry on the cake, the masked sun came shining through the clouds. The free wheeling slopes on the flyovers that I enjoyed in the morning now seemed a daunting task of climbing first and then somehow the downhill ended abruptly. By the time I reached Mumbai’s borders it was 1.15pm. Dust, bad roads, traffic all welcomed me ensuring that I don’t feel left out. Around Aarey colony, I felt so zapped that given an option to put my cycle in a car, I’d happily accept it. The home door bells rang by 3.00pm where I entered, pulled the shoes out and laid flat on the back right next to the shoe-rack. During the shower I manged to have a quick nap while sitting on the bathroom floor, only to be woken up by my mom who was knocking on the door. Good stuff Ruturaj, all the articles are written really well, Kudos! yes, I do. How are you doing?